AIC Kosirai (red) beat Uganda's Kinawa 3-0 to reach the quarter final. Newcomers Barding and Bukembe schools from Kenya progressed to the quarterfinal of boy's football in the Federation of East Africa Secondary Schools Sports Association in Eldoret. Barding from Lake Region was the first team to qualify after edging out Ugandan champions Kibuli Secondary School in an early morning match played at Hill school ground. A goal in the fourth minute Andrew Omondi was enough to send the first timers into the last four. They beat Hanika of Rwanda 2-0 on Monday. Barding has not conceded a goal in Pool A which has three teams. Head coach Chrisantus Otieno said they have been trying to play at the region and national level for a long time. “This is our year and we have a point to make come the finals. We want to fly Kenyan flag high in these games. We are taking each game like a final," said Otieno. After losing the final national match to Laiser Hill, Otieno was optimistic could go all the way and possibly face Laise Hill in the final. Bukembe who are debutants both at national and regional finished second in Pool C after beating Rwanda’s College Gisenyi 2-1 at Eldoret Sports Club. The Bungoma-based team collected seven points with three goals while St. Mary’s Kitende topped the poolbecause they had a better goal aggregate. In this match, Jeremiah Wanyonyi scored the first goal in the sixth minute after challenging two defenders and his right foot shot beat Gisenyi’s goalkeeper Selde Ntangisanongo for a 1-0 lead. Eight minutes later, Issa Bijimana equalized through a penalty after he was fouled by Norman Andpheres. Issa’s shot went to the left corner of Bukembe’s goalkeeper Jeremiah Mesuswa. Victor Omondi restored the lead after heading Wanyonyi’s corner in the 32nd minute for a 2-1 lead at the break. There were no goals in the second half. In Pool B, qualification to the quarter final may be decided by a toss of the coin after each team finished with four points with no goals scored. National champions Laiser Hill recorded its first win against Tanzanian side Alliance on Wednesday evening. Geoffrey Ouma scored the only goal in 36th minute. Laiser Hill were beaten by 2015 national champions Passenga in their opening match before battling to a barren draw against Ugandan Masaka. Masaka who beat Passenga by a solitary goal from Cylas Mukalazi on 67th minute, lost to Alliance in the opening match on Monday and drew 0-0 against Alliance. Harambee Starlets star Mwanahalima Adams steered her team, St John's Kaloleni to the quarter final to be played on Thursday. They topped Pool B with seven points after a 1-1 draw with Uganda's Masaka. Adams scored in the 22nd minute. This was her fourth goal in the championship. Babirye Sana leveled for Masaka in the 68th minute. In another Pool B match, GS Remera of Rwanda easily beat Alliance of Tanzania 3-1. Captain Dorothee Mukeshimach scored for GS Remera in the 30th minute and Eruikia Karonga equalized for Alliance seven minutes later. Caliste Iradukunda netted the second goal for Remera five minutes after resumption and Agathe Irukumutiwa added the third in the 63rd minute. Cheptil restored their pride on Wednesday morning by defeating Lycee De Nyanza 3-2 in Pool A. Cheptil lost to defending champions Rusumo from Rwanda. The Nandi-based school won the first, fourth and fifth sets while De Nyanza won the second and third sets. In the same pool, Uganda's Luyanzi easily beat Kenya's Tetu 3-0 (25-22, 26-24 and 27-17) at Eldoret Polytechnic ground. 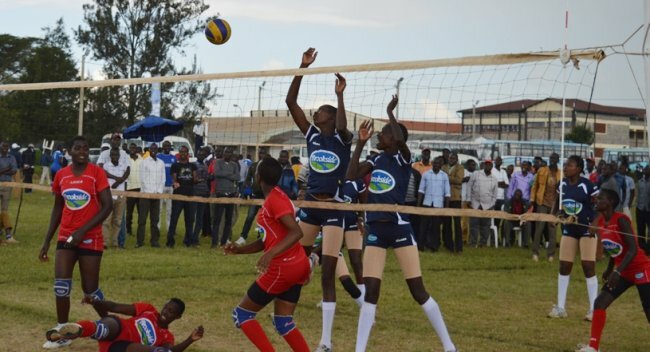 In the girl's category, AIC Kosirai won 3-0 (25-22, 25-17 and 25-20) against Ugandan Kinawa Girls while Uganda's St. Aloys battled past Kenya champions Soweto 3-2 (25-20, 25-22, 15-25, 22-25 and 15-10) in Pool A.
Kakamega High beat Namilyango of Uganda 15-9 at Eldoret Sports Club. It was their third win. Wiseman Aganga touched down as Kakamega led 5-0 at half time. Three minutes after the break, Kakamega captain Felix Odhiambo scored the second try for a 10-0 lead before Mark Semakula converted a penalty for the Ugandan side. Christand Ojuang crossed the line for Kakamega's third try to stretch the lead 15-3. Semakula drilled over his second penalty to narrow the scores 15-6. He added a third for the final 15-9 margin in Kakamega's favor. Uganda's Kibuli beat Kenyan side Makongeni in boys' handball While Mbogo High defeated De Nyanza 29-9 and Moi Girls Kamusinga defeated Apenga from Rwanda in girls handball.